This project called for Two Fireplaces in one home to be transformed from average to Amazing with the addition of slabs. Many brand new homes are sold with bare white walls. Most of the upgrades happen around kitchen and bathrooms with the addition of stone counters, backsplashes, “fancy” tile in bathrooms, etc. 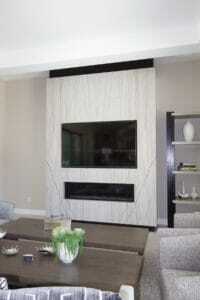 If there are fireplaces, most are blank walls with linear fireplaces being the accent on wall. 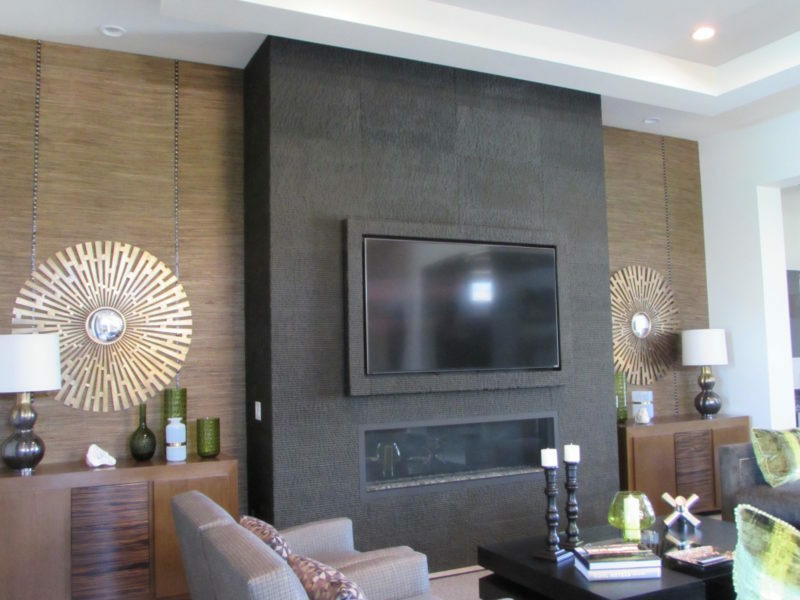 Maybe a large screen TV or picture at center of wall, but to make it truly your own, you must add special touches throughout the home. This was the case in this home where the designer added personalized touches from the owners. The next pictures show the fireplaces with walls removed. 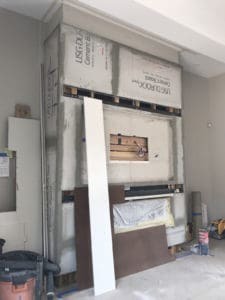 In order to hang slabs of stone on walls, we add additional support to hold the weight without any issues. If there is any media equipment that will go onto wall, those areas need framing as well, particularly for recessed niches. This is the original wall with a linear Fireplace. There usually are connections on wall where a large TV is placed. Those can be relocated during framing or stay at current locations. 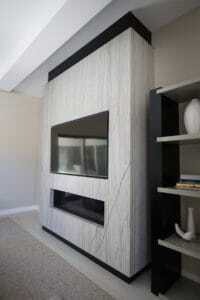 On ground level fireplaces, you can add any kind of stone or finish to wall, even heavy brick. Fireplaces on second floors are another story. 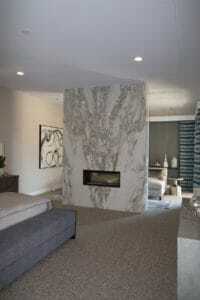 The location of the Fireplace on the second floor for this project had to be approved by an engineer. Because of the heavy weight of slabs in addition to all other material, the structure or floor trusses below had to be able to handle the additional weight on them. This is why getting professionals and accredited subcontractors on you project is important. 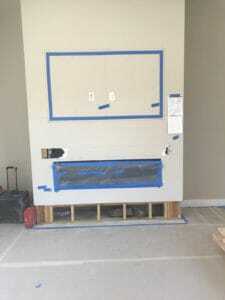 This picture shows the wall prepared for stone slab. 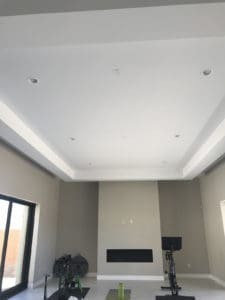 All subcontractors that we use, have to specify all the material that they are going to use in each project down to the type of glues or adhesives. This will ensure that the finished job will be to the highest standards and stone will remain on wall for many years. The new walls definitely look much better than the original bare walls. 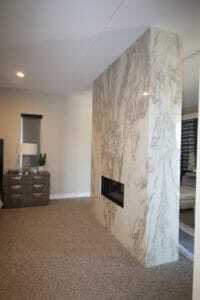 Even small accents like the color difference at top and bottom make the stone slabs standout on the large wall. This is the result of many people involved. From the owners and Designer , to our workers and subcontractors. Everyone puts all their effort into completing something that our clients will enjoy for a long time.